As we head into the cold and flu season, it’s important to make sure all we are getting from the gym is a great workout. Due to the sheer volume of people they house, gyms can be a breeding ground for a wide variety of bugs. Keep extra bandages in your gym bag or car, and cover open cuts before getting on the Stairmaster. Open wounds are an easy entry point for germs to get into your body, putting you at greater risk for infection and illness. 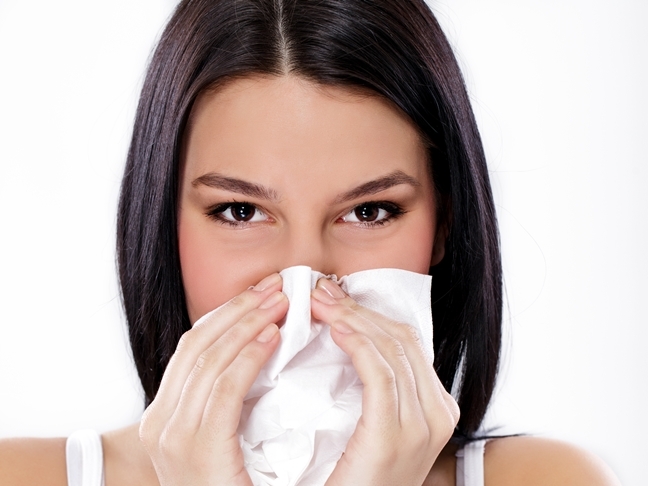 Exercise mats can host not only common cold and flu viruses, but serious skin infections, as well. Because we come in close contact with mats, and often create friction against them with fitness moves, we are opening the door for skin infections. Fungal, viral, and bacterial skin infections can linger on mats for several hours or more. Avoid exposing yourself to serious antibiotic-resistant bacterial infections, such as MRSA, or lesser, still undesirable ones, such as herpes, impetigo, and ringworm, by bringing your own mat. 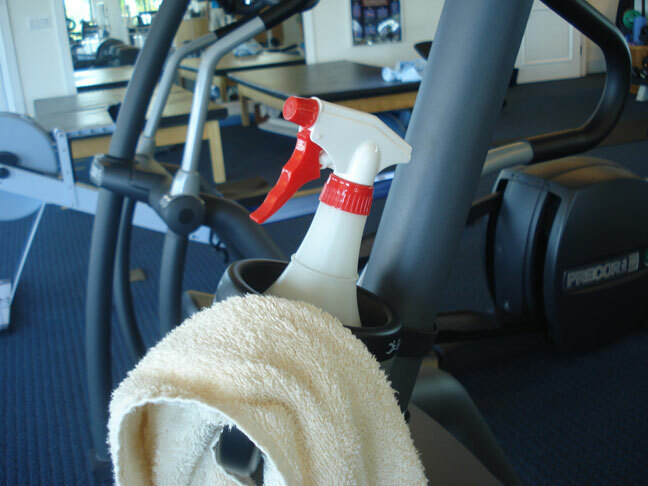 Most gyms provide paper towels and sanitizing spray for wiping down machines. Be sure to wipe it down before your workout, as well, in case the person before you was not as considerate. If you happen to be a member where cleaning supplies are not provided, or you are uncertain about their potency, carry your own disinfecting arsenal. It may sound like overkill to break out personal sanitizing wipes, but it’s worth the extra step if it helps prevent exposure to a nasty virus. I am all for saving the earth and I try to conserve energy by limiting excessive use of household items that require washing. However, when it comes to gym towels, more is more. Never use the same towel you wipe down your equipment with to mop up your sweaty face. Stick with paper towels for cleaning the machines, or carry two towels: one for you, one for the benches. Always use a separate, clean towel altogether for your post-workout shower. Hit the showers at the gym before heading back to work or home. After your workout, be sure to visit the locker room for a sudsy shower that includes antibacterial soap from head to toe. Keep an old pair of flip flops in your gym bag, too, to protect your feet from unwanted communicable bacteria, viruses, and funguses in shower stalls. Don’t forget to treat your shower shoes with disinfectants from time to time, and allow them to dry in the sun. Before even hopping in the shower, ditch your dirty gym clothes into a separate plastic bag and stow them in your gym back; your “dirties” should always be kept separate from your “cleans”. Wash all gym clothes and towels in hot water with a concentrated detergent when you launder them at home. Because your gym bag sits on grimy mats and floors, be sure to wash it once in a while, too. 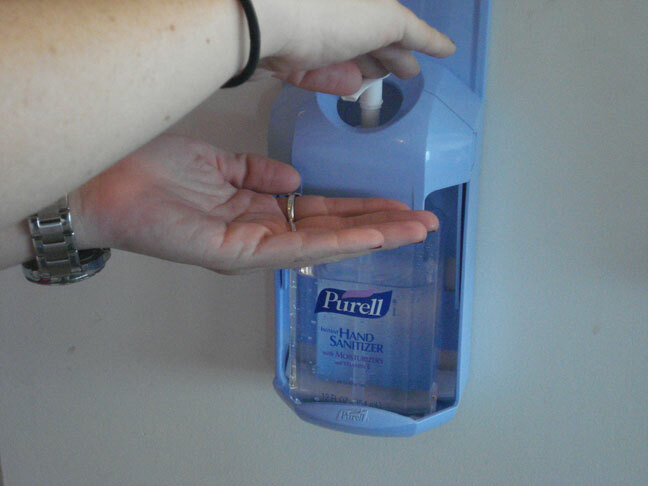 Lathering up is still the best defense we have against germs. If time constraints won’t allow you to shower at the gym, at the very least, give your hands a good long scrub before heading out. Just as you learned as a kid, sing the A, B, C song to ensure you are scrubbing long enough, and don’t neglect in between your fingers and the backs of your hands, as well.